I have always found Henry Threadgill’s music very well orchestrated, well thought through from a compositional sense, and yet containing the immediacy and excitement of first class jazz improvisation. Although having a jazz pedigree (among his past accomplishments is his association with the AACM and work with the group Air) Threadgill’s music contains a compositional rigorousness and discipline that can be found in much classical avant-garde music. That’s not to say that Threadgill writes in a similar style to composers from this genre or that the pieces he writes should be considered to be in this twentieth century compositional style, although at times there are similarities. However, the music on this album is clearly jazz, and you can hear it quite distinctly in the rhythmic interplay, the swung beats, the phrasing, the articulation of notes and most importantly in the group improvisation that is at the very heart of Threadgill’s compositional approach. Utilising different combinations of instruments is something that clearly interests Threadgill as a band leader and throughout his solo career he has put together some intriguing ensembles, a good example of this being Very Very Circus with it’s platform of two tubas and two guitars. 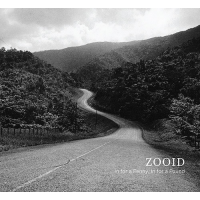 However, Zooid seems to be his band of choice at present and has been for well over ten years, the line-up consisting of Liberty Ellman – guitar, Jose Davila – trombone & tuba, Christopher Hoffman – cello, Elliott Kavee – drums, and Henry Threadgill – flute & saxophone. With the use of acoustic guitar, cello, and tuba this creates a chamber ensemble type feel to the group, which in turn lends an intimacy to the pieces on offer. As a double disc there are six pieces on In For A Penny, In For A Pound with four of them having a highlighted soloist, so there’s one for drums and percussion, one for cello, another for tuba & trombone, and one for guitar. To stretch the link with classical avant-garde chamber music further it seems that each track could be likened to a concerto for each of the solo instruments mentioned, although there are other soloists within each of the pieces as well. These pieces are quite long, with clearly defined sections, and last between fifteen to twenty minutes each. There are also two shorter tracks, which open each of the discs. The album starts with the title track, whilst the drums and tuba provide the trace of a funky rhythm section the rest of the ensemble provides a multi-coloured carpet of sound which is made up of individual fragments from each instrument that blend into a coherent whole. This sets the tone for the whole album where abstract grooves rub shoulders with more arhythmic sections, particularly where the drums break from providing the momentum and pointillistic textures give way to more static and sparser sections within the music. In fact, it is this movement between the jazzier syncopated rhythms and the more avant-garde chamber music sections which provides much of the structural contrasts for the works included on In For A Penny, In For A Pound. This is a quality product from one of the best jazz composers creating relevant and intriguing music in the world today. With over an hour and a quarter’s worth of music on this release it would seem that the album is also aptly titled.